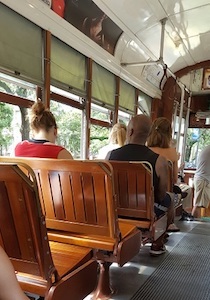 Squealing hot brakes, grinding metal on metal, and a rough, jerky ride hardly evoke feelings of adventure and romance, but in New Orleans these sounds and sensations mean one thing: a ride on an authentic streetcar. Not far from the crowded sidewalks of the French Quarter, shops selling NOLA T-shirts cheap, and packs of frat boys staggering to the next bar, visitors can escape to a time more than 150 years ago when life on the Mississippi was genteel and grand. Be swept away to another era aboard the St. Charles streetcar. Rambling along, the city’s warehouse district quickly falls behind and soon pristine southern mansions begin to appear. A mansion may be as simple as a lovely two-story house with a breezy wrap-around porch, white wicker armchairs, and a porch swing, or it might be a much grander three- to four-story antebellum masterpiece with Greek Revival columns, rolling green lawns, majestic fountains, gardens bursting with pink azaleas, cascading Confederate jasmine, vibrant blue hydrangeas, lavender peonies, and delicate buttercup tea roses. While many locals who use the St. Charles line to get around in New Orleans hardly take notice of these impressive estates, visitors can enjoy miles of spectacular home-and-garden-gawking pleasure. The St. Charles line takes travelers to the Garden District. During Hurricane Katrina, an event which still marks time for residents of New Orleans in a pre-Katrina, post-Katrina kind of way, the Garden District and its magnificent old homes remained relatively undamaged — at least by flood waters. Their high point on the Mississippi River preserved a rich history. Originally a sugar plantation, it was divided into large garden parcels in the 1830s. Wealthy cotton, sugar, and shipping tycoons of the day, wishing to distance themselves from the immigrants who occupied the French Quarter, built opulent classic-style homes there. Visitors today still reap the rewards of this relatively short period of building and expansion in New Orleans that took place before the Civil War came crashing down on the South’s antebellum-style construction. Hop off the St. Charles line at Washington Street, and step into the midst of this famed Garden District. 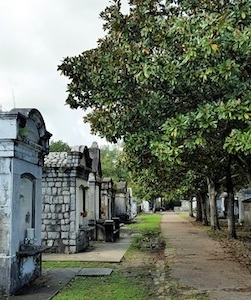 A short walk from the streetcar lies the Lafayette Cemetery with its shaded magnolia-lined avenues. 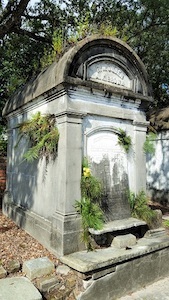 Visitors are free to roam and gaze at hundreds of above-ground plots with family names and dates; however, local, certified guides linger outside the gates and can be hired for as little as $10 per person for a short tour to explain some of the more interesting and bizarre facts about the cemetery, then continue on to the Garden District’s historic residences, seeking out celebrity homes and which ones are believed to be haunted. Movies such as The Curious Case of Benjamin Button and Easy Rider were filmed here. 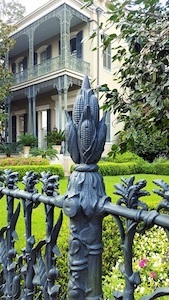 Learn why some homes have a sweeping double staircase entry, why porch ceilings are painted sky blue, and why Colonel Short had a cast iron cornstalk fence erected on his property’s perimeter. The famous restaurant, Commander’s Palace, training ground for today’s top chefs, home of the lunchtime 25-cent martini (limit three “’cause that’s enough”), and host to the finest Sunday jazz brunch in New Orleans, also resides here. Hop back aboard the streetcar for more enchantment, rumbling beneath live oaks and past more dreamy antebellum mansions. Stop for refreshment and indulge in the graceful ambience of the Columns Hotel, once home of the country’s largest manufacturer of cigars. A fateful scene from the film 12 Years a Slave was shot here. Continue traveling along St. Charles to Loyola and Tulane Universities. Venture into Audubon Park and Zoo, a 350-acre urban oasis, or stroll through the campuses. Tulane’s former campus stadium hosted the original Sugar Bowl games from 1935 to 1974, the New Orleans Saints games from 1967 to 1974, and three early Super Bowl games in the 1970s. Visitors short on time in New Orleans can simply venture out and back on the St. Charles line, taking just a couple of hours, with plenty to see from the streetcar windows. Or take an entire day. Exploration in this elegant district of New Orleans can be entirely self-guided. The St. Charles line is a vintage source of transportation in a 21st century city. It fills up with tourists, college students, and grocery-toting locals. A modern community cross section rides these rails every day, yet this old streetcar can transport riders on a magical trip through history, an amazing journey to experience a time and place when ladies wore hoop skirts and cotton was king. New Orleans streetcar fares are $1.25 per ride (exact change only), or 1-, 3-, and 31-day unlimited ride passes (Jazzy Pass) for $3, $9, and $55 respectively.